It’s official. I’m declaring this Christmas the year of K.I.S.S. decorating. That means “Keep It Simple, Stupid”, for anyone wondering. Since I’m not feeling excited for a ton of Christmas clutter all over my house this year, I’m not going to do anything elaborate or crazy for 2012 decorations. I’m trying to keep things straightforward, beautiful and simple. Let’s see if I can keep that up all season. I was sad to see my pretty pumpkins get tossed in the trash, but they were way past their expirations dates and starting to mold. I replaced them with this old sled that I found in a pile of junk at a local thrift store. I tied some evergreens with a burlap bow and some jingle bells and called it a day. 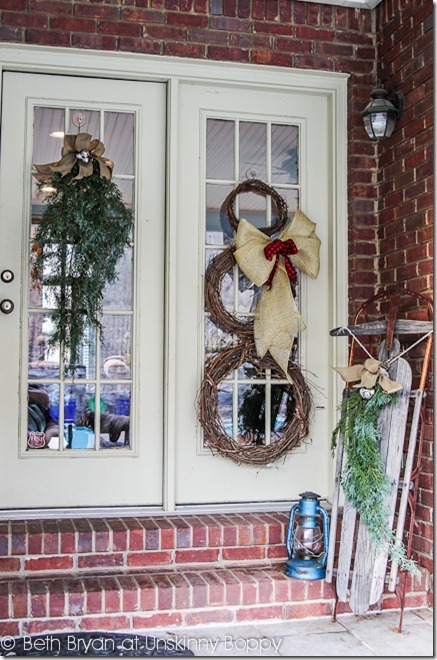 The cute grapevine wreath snowman is held up with suction cups for each varying wreath size. 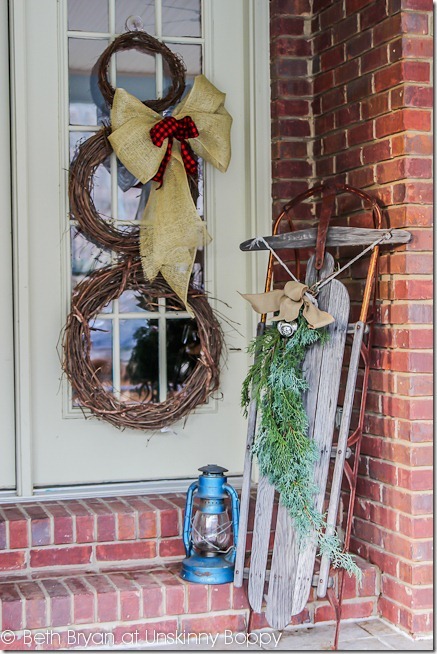 I bought the big burlap bow premade from a local home decorating store that carries a ton of the deco-mesh bows. I loved the buffalo check ribbon in the middle of it the most. 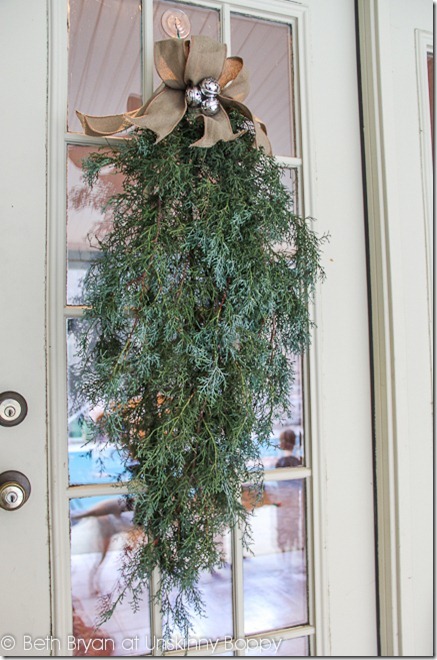 On the door is another simple evergreen swag tied with more burlap ribbon and jingle bells. KISS to the max here, folks! 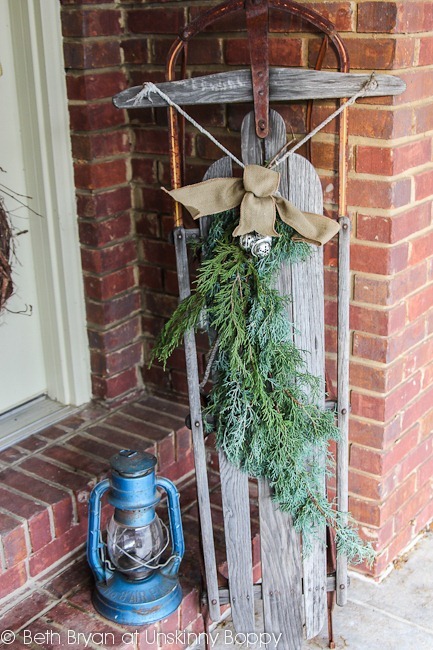 I took my cues on this pretty arrangement from Amy’s DIY Holiday Decor on the FOLK blog. She made some pretty greenery decorations with cheap jingle bells that she found at the Dollar Tree. I loved the way hers looked so I bought some of my own and wired them to the top of these spruce boughs. All in all, this little outdoor vignette took me about an hour to create, not including the amount of time it took me to scrub down the rotten pumpkin goo left behind from my Fall decor and also tell my dogs to Sit! Look! Wait! for this photo. They did get extra treats for cooperating (finally). What’s on your porch this season? « Let’s get ready to JINGLE! ha, your poor chocolate pooch looks so so ready to just get a treat already. Simple. I like that. And it’s pretty cute too! Wonder if some of that simplicity will rub off on me? I love the sled. 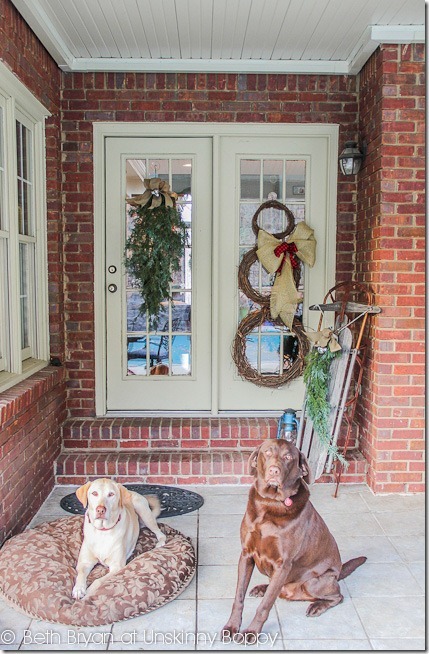 I’ve been wondering what to do with my front door. Outside decorations do not last as my door is exposed to the elements. 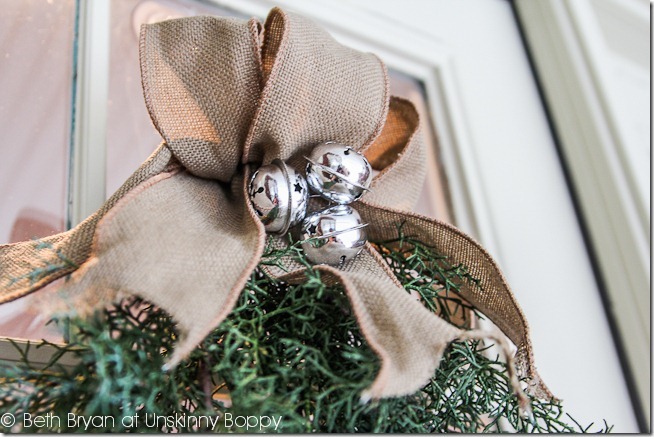 The greenery and bow are very simple yet elegant. 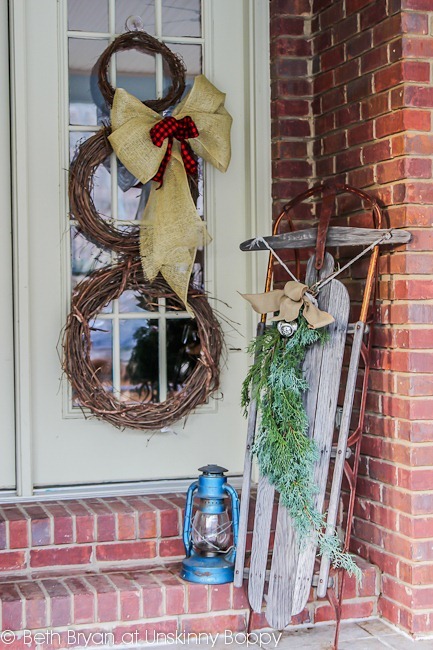 I cannot wait to get my sled out of the garage and decorate it. 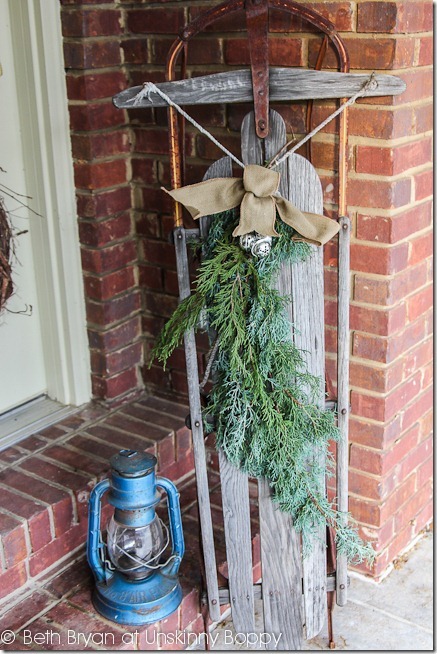 You are the QUEEN of beautifully simple decor like this Beth — it is just lovely!